The just-out October issue of American Patchwork & Quilting has a 4-page article about the 12 years of The City Quilter’s “Dear Jane” classes, with all our students over those years using our classroom BERNINA sewing machines (which have been aurora 440QE’s for about the past 6 years or so) when they were stitching on their Dear Janes. 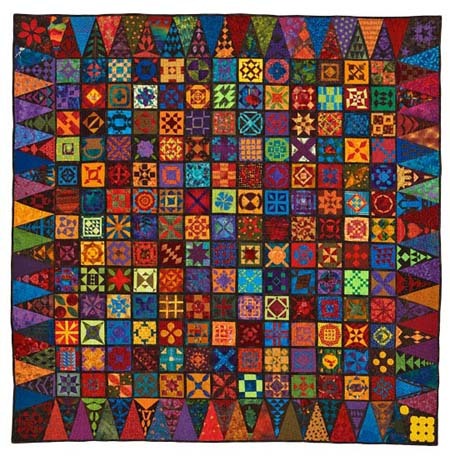 The article was written by Diane Rode Schneck, The City Quilter teacher and part-time staffer. The focus of the article is “Jane and the City,” or in other words, the somewhat special focus of our urban “Janiacs” (term coined by Diane Rode Schneck). Besides the seven student quilts featured, plus “In Our Time” by our co-teachers for those 12 years, Judy Doenias and Diane Rode Schneck, APQ has posted a photo gallery of our students’ quilts, along with some close-ups, at AllPeopleQuilt.com/538.